I think it’s absolutely critical for this court. This is an opportunity to have a full court going into the new session — the start of the session. There’s plenty of time to do this. And so I hope that we can have a process that gets back to what it used to look like in the Senate, where you have Republicans and Democrats working together to find somebody who’s right for the country. I think if you look at that situation, a completely different situation than what we have now where, you know, according to the Biden rule and others. This is not a presidential election year. This is not months away from the American people determining a new president that could influence the direction of the court. We’re not even halfway through the president’s first first term, so I think we’re talking a totally different situation, there, and an opportunity for us to put somebody on the court like Neil Gorsuch. Neil Gorsuch as a great Coloradan and [I am] looking forward to somebody like him — or her — and go onto the court. Of course Gardner says that this is a “completely different” situation, because…well…mostly because there is now a Republican in the White House. 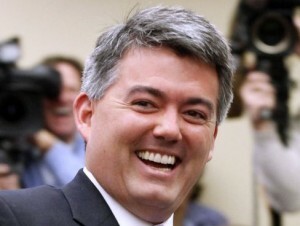 Gardner has the moral leadership of a turnip. "This is not months away from the American people determining a new president that could influence the direction of the court." So… the Senate doesn't influence the direction of the Court? Power Politics. It eats Liberals for lunch. If you are playing power politics, nobody cares that you are a hypocrite. Well nobody but "moderates", the Democratic Party establishment and both-siderist pundits. The religious right certainly doesn't care that Trump lives an anti-"Christian" lifestyle. They only care that he delivers an anti-abortion Court. He's right. It's not a presidential election. It's totally different and you'd be obstructing. Sorry libs. Mr. McConnell laid the groundwork for the right-wing insurgency of 2009 and 2010 in another way, too, with his decision to withhold Republican support for any major Democratic initiatives in the Obama years. But Mr. McConnell, prioritizing elections over policy, calculated that by blocking or delaying Democratic legislation, above all through aggressive use of the filibuster, Republicans would create a tedious gridlock that voters would blame the Democrats for. After all, weren’t they the ones in power? Now your party is in power, merrily abusing it to the detriment of our economy, freedom and health (as Park Hill correctly notes in another thread). Trump's malevolent incompetence is coming home to roost, and you'll be the last to know it. When more farmers go bankrupt, factories in Middle America start laying off workers and moving jobs overseas due to the tariffs, hitting Red states the hardest, the Republican Party will be an obscene word in the minds of millions of voters. While else the rush to jam thru any RWNJ Joe Blow into the SCOTUS? Because you know you're going to get your asses handed to you in November. Didn't American soldiers obstruct Hitler –like my father in law, a Normandy combat engineer? When you face pure evil, like Trump, decent people do obstruct. You just want a fascist judge that will put people into Trump Camps. Moderapist, do you agree that the citizenry has the God-given right to exercise Second Amendment remedies upon determining that their national government is becoming tyrannical? And, this is a Thursday. The Garland nomination happened on a Wednesday. At least we can take comfort in knowing that if the Republicans retain control of the Senate, they will not consider any Supreme Court nominee from President Trump (or Pence) in 2020, a presidential election year, if anyone passes away or retires. They will be true to their principals and allow the American people an opportunity to elect a Democratic President and Senate, before any nominees are even considered. This President, under a cloud because his campaign (and personal treasury) was riddled with Russian dollars and dealings, should be considered as though he might not be there for long. The Senate is up for election, and Republicans will never have a better map for retaining their majority. They should be proud to maintain their new position on SCOTUS nominees. Or we can just admit, as McConnell himself did, that it was never about some "rule" – it was just McConnell being proactive and making his ever-more-radical caucus (also up for election at the time) happy. Cory Booker said the same about The Yam packing SCOTUS while he's under investigation. Of course he's going to try to apply a loyalty test to anyone he nominates. He wants someone who will side with him on any matter that arises from Meuller's investigation. We know Cory is a hypocritical simpleton. What is Bennet doing? Has he wet his pants over this? Surely CPols will keep apprised of his Monumental Pronouncements. And where will we place his statue? Hey Z. Please drip the Bennet obsession this electoral season. You'll have a chance to primary him later. Meanwhile contribute usefully and persuasively, and maybe you will build up your street cred. His street cred is long gone. And it's not ideological because he gives a pass to others who are less left wing than Bennet. He has some kind of personal peeve about Bennet. You and Zap are peas in a pod. You each have your obsessions – yours is Jill Stein Voters, his is Michael Bennet. Both are one-dimensional super-villains to blame for every political woe we face. Other than your obsessions, each of you sometimes has interesting ideas to contribute and articles to point to. You are each chasing your white whales – his from port, you from starboard. Morning Joe and crew were discussing "Neutralizing the Nuclear Option," which dusts off FDR's court-packing scheme and suggests the Dems implement it in 2021 if they win the House,Senate and presidency. In 1938, it flopped because the parties were not as ideologically extreme as today. This time it might work. This way we are only stuck with this court for 3 years rather than 30 years. Packing the court in 2021 is a reasonable response to the theft of Garland's seat. Fitst, we need to win the presidency and both houses of Congress , though. Always, always. always follow the money. In 2017 Deutsche was fined for $10 billion Russian money-laundering —in January Trump waived fines. Where are we supposed to follow the money? Through a time warp? Trump's relationship with Deutsche Bank began in the late 1990s. Kennedy's son was on the commercial lending side and made some loans — which went bad in 2008, triggered a dispute between Trump & DB commercial real estate division, which were eventually settled. Trump's biggest loans (and his more current ones) came from the private banking side of DB. Justin Kennedy was not a part of those deals. He had left DB for other work — I can't find exact dates, but he was with another firm in October, 2010. Here's a Financial Times article from last August that spells out the relationships in more detail.